On Friday the 18th I broke the cycle and actually woke up at a normal time. This meant that Dad and I were on the road to Grandma Davenport's on time but when Dad called to make sure she was ready, there was no answer... because she was knocking on our front door. Oops. No worries though, we just headed toward a convenient meeting spot to make the transfer and you know, maybe share a parfait with GmaD. After breakfast we headed over to Grandma Herbert's - WHAT THE WHA? GmaD heard about a "Girl's Day Out" at the Family Tree Nursery so we decided to check it out. Where's the fable? I mean, this thing stuck out like a fish out of water -- HA! What's even funnier is that Family Tree Nursery featured it on their blog as well, though not quite in the same manner. 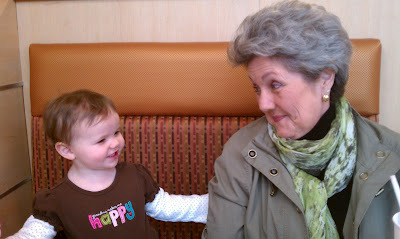 After GDO@FTN the three of us headed to Nordstrom to see Aunt Abby and of course, have lunch at the Cafe. By this point I was worn out so we dropped GmaH off at home and headed back to G&G D's for nap. When I got up, GmaD and I did some more work in the backyard though to be honest, I spent most of my time scoping the bird feeder to catch a view of birdies. And still none. I have to imagine we had dinner with G&G D on Friday night but there aren't any pictures of it so maybe it didn't happen. I can't believe my memory is this bad and I'm not even two yet. Ugh. Well regardless, my spring break with the Gmas was wicked fun. I hope they had fun too because they're gonna be splitting time with me again in about eight weeks. Rest up ladies!